Introduction: This series of posts is intended to show that despite Greg Hunt’s loyalty, all is not right at the Bureau of Meteorology. In light of this endorsement, here are some examples of “World’s Best Practice”. Wilsons Promontory Lighthouse is on the southernmost tip of the Australian continent, about 170 km from Melbourne. 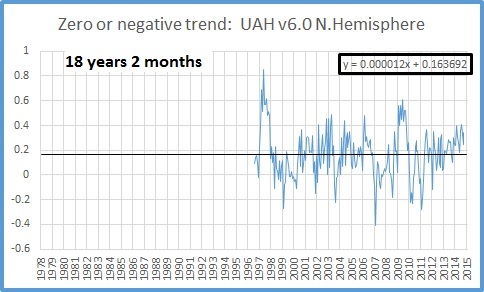 The story of temperature adjustments here illustrates much that is wrong with the Bureau: misinformation, incompetence, lack of transparency, and unscientific behaviour. Note: Both maxima and minima at Wilsons Promontory are warming. The Minima trend has been cooled, the maxima warmed. I have no comment on whether the adjustments are justified. I am only interested in the methods used. 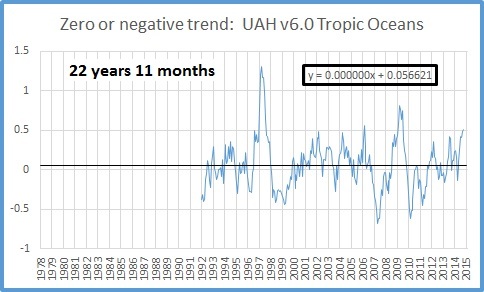 ACORN-SAT, (Australian Climate Observation Reference Network- Surface Air Temperatures), was introduced in March 2012, with several revisions mainly to bring the series up to date. It is a daily dataset of minima and maxima, from which monthly and annual means are derived, for 112 sites around Australia. Raw temperature data at these sites were homogenised by a complicated algorithm by comparison with neighbouring sites. After much criticism, the Bureau has been forced to provide some answers, and agreed to ‘checking’ by a Technical Advisory Forum. The Bureau has provided additional information at the Acorn website, and in September 2014 released a list of the sites with adjustment dates, amounts, and the neighbour sites used for adjustment (see http://www.bom.gov.au/climate/change/acorn-sat/documents/ACORN-SAT-Station-adjustment-summary.pdf). Unfortunately, this additional information has raised more questions than it has unsuccessfully answered. This is a half-truth, and completely misleading- some would say, dishonest. The Bureau provides raw data at Climate Data Online at http://www.bom.gov.au/climate/data/, and adjusted data at http://www.bom.gov.au/climate/change/acorn-sat/#tabs=Data-and-networks. The Bureau has adjusted all Wilsons Promontory maxima before 1/1/1950, and minima before 1/1/1930, and provides daily adjusted temperatures from 1/1/1910. Unfortunately, there are NO daily raw data for Wilsons Promontory before 1/1/1957. Where are 47 years of daily temperatures? How is it possible to have adjusted digitised data but no raw digitised data? Likewise, of the 10 neighbouring sites used for the pre-1950 maxima adjustments, only five have daily raw data before 1957, and for minima, only two (and one is Melbourne- more later). Were the adjustments made with only two comparisons? Otherwise, where are the data for the others? This lack of transparency makes it impossible to replicate and analyse the adjustments at Wilsons Promontory. If it can’t be replicated, with all data made available, it isn’t science. There are 79 instances when Acorn shows that the minimum temperature, the lowest temperature for the 24 hour period, was higher than the maximum temperature. That dot at ‘1’ shows that on 5th December 1911 the coldest temperature was one degree hotter than the hottest temperature! All of these occurred before 1950, so it is impossible to compare with the raw data. The Bureau dismisses this as a minor hiccup of no importance, as an artefact of the adjustment process. The Bureau goes to great pains to explain how carefully the raw data was checked to remove any glaring errors and mistakes. On page 31 of CAWCR Technical Report No. 049, the section “Quality control checks used for the ACORN-SAT data set” describes a test for internal consistency of daily maximum and minimum temperature, which was carried out on the raw data of the ACORN-SAT sites. 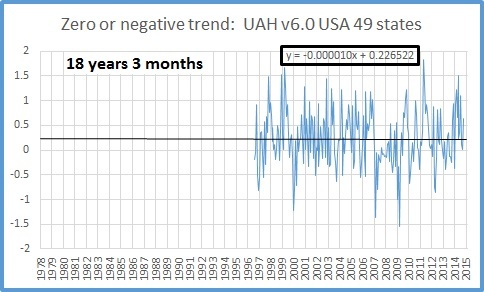 This test for minima greater than maxima, the first and most important quality control check, obviously was not applied to the adjusted data at all, and these nonsensical values remain years after sceptics made the Bureau aware. Any organisation that can’t perform a basic quality control test on its product is incompetent, as is any Review Panel or Technical Advisory Forum that endorses it. Here are the neighbouring sites used. Maxima: East Sale Airport, Geelong SEC, Laverton RAAF*, Orbost, Queenscliff, Cape Otway Lighthouse, Melbourne Regional Office*, Essendon Airport, Currie, and Ballarat Aerodrome. 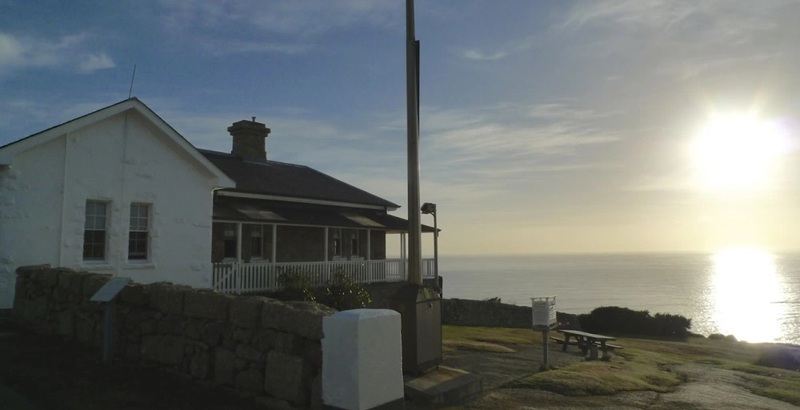 Minima: Cape Otway Lighthouse, Kerang, Melbourne Regional Office*, Eddystone Point, Geelong SEC, Bendigo Prison, Swan Hill PO, Cape Bruny Lighthouse, Currie, and Ballarat Aerodrome. Included in the eight stations not used in climate analysis because their records exhibit Urban Heat Island effects are Laverton RAAF and Melbourne. 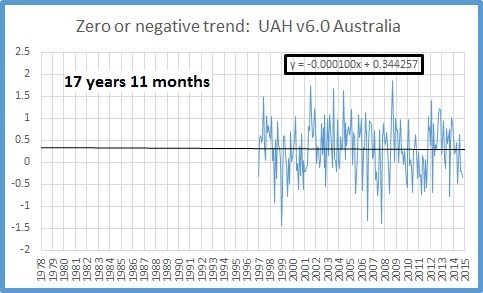 Even though UHI makes Melbourne and Laverton unsuitable for use in climate analysis, the Bureau still uses them to adjust the data at Wilsons Promontory! Cape Bruny Lighthouse is on the far south east coast of Tasmania, and is 509 km south of Wilsons Promontory. Kerang is on the Murray River, 413 km northwest, in a dry inland area, as is Swan Hill, 468 km away. Were there no better correlated sites nearer? Problem 5: Results of adjustment. 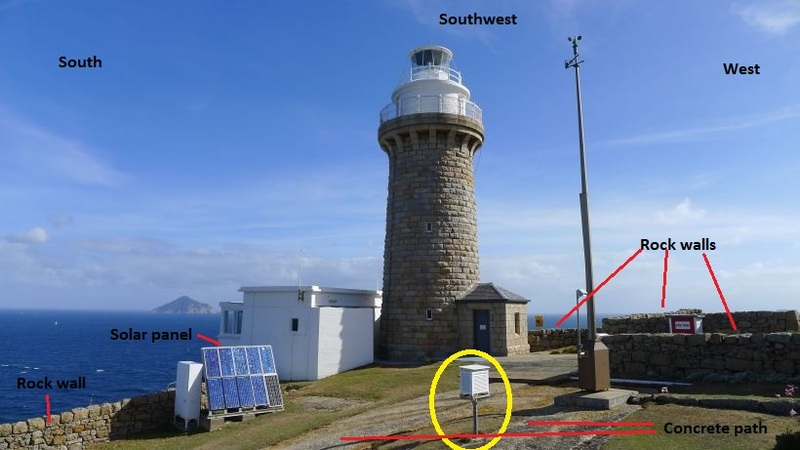 To compare the temperature record at Wilsons Promontory with its neighbours, as we don’t have daily data, we can only use monthly or annual data. A simple but reliable method is to calculate the difference between Wilsons Promontory and each neighbour. 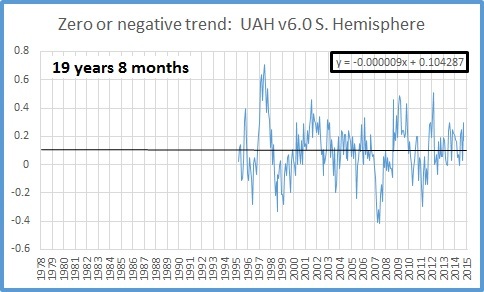 This is done for raw and adjusted anomalies from the mean of a common baseline period. If Wilsons Promontory compares well with its neighbours, the differences should be close to zero, and most importantly, in spite of any short fluctuations, there should no trend: Wilsons Promontory should not be warming or cooling relative to its neighbours. Unfortunately there are no monthly or annual data before 1957 for Eddystone Point or Bendigo Prison, so comparison is further restricted. 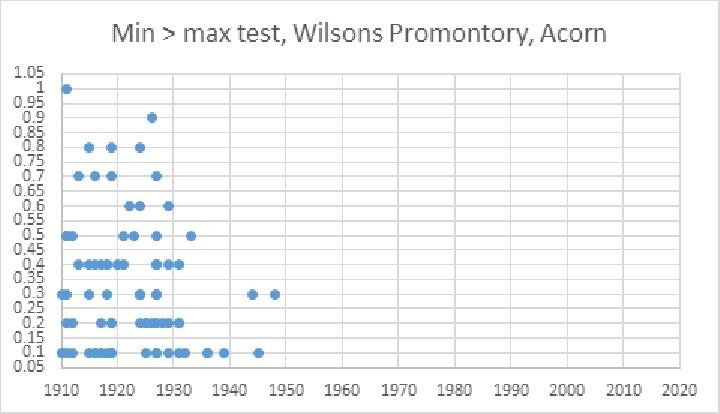 Firstly, minima: Wilsons Promontory minus neighbours, annual anomalies from 1916-1945, raw data. The differences range from +2 degrees to – 2 degrees, so there is plenty of variance, but the bulk of differences are +0.5 to -0.5 degrees. The spaghetti lines can be averaged to show the mean difference. 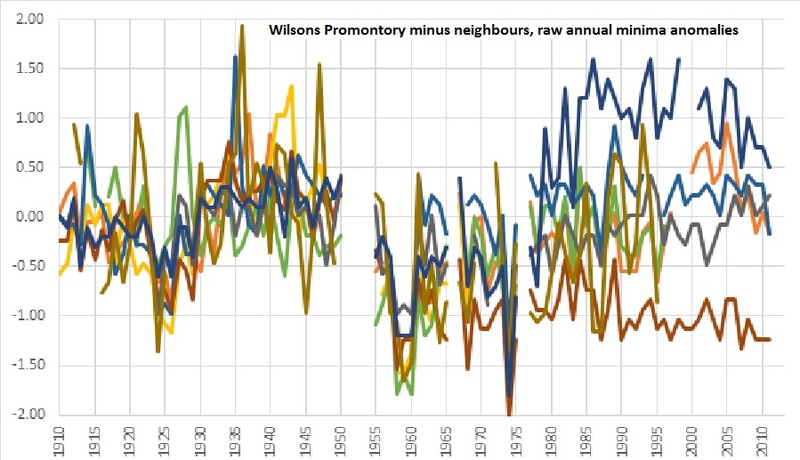 The Acorn adjusted record preserves the periods of large differences, but has Wilsons Promontory cooling relative to its neighbours by more than half a degree per 100 years. The adjustment was too large. Here is the comparison for maxima (anomalies from 1936-1965). 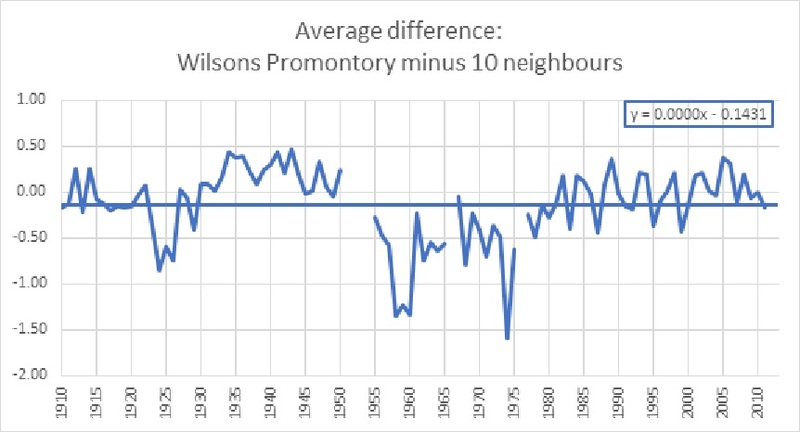 The raw data show Wilsons Promontory cooling a little (-0.13C per 100 years) relative to the neighbours, but Acorn overcorrects, resulting in warming (+0.18C per 100 years) too much compared with the neighbours. • Sites should be representative of the mean conditions over the area of interest (e.g., an airport or climatic region), except for sites specifically intended to monitor localised phenomena. • The instrument enclosure (if there is one) should be level, clearly defined and covered with as much of the natural vegetation of the area that can be kept cut to a height of a few centimetres. • The base of the instrument shelter should be 1.1 metres above the ground, with the thermometers approximately 1.2 metres above the ground. • If no instrument enclosure is provided, the shelter should be installed on level ground covered with either the natural vegetation of the area or unwatered grass, and should be freely exposed to the sun and wind. It should not be shielded by or close to trees, buildings, fences, walls or other obstructions, or extensive areas of concrete, asphalt, rock or other such surfaces – a minimum clearance of five times the width of the hard surface is recommended. The first view is towards the southwest, towards the direction of the prevailing south-westerly winds. Note the large areas of concrete under and near the Stevenson Screen; the nearby rock walls, the nearby solar panels almost directly to the south of the screen. The second photo is in the opposite direction and shows the proximity of a building, another rock wall, and the steep slope of the site. They cannot have it both ways. If a 1m high rock wall interrupts wind flow and reflects heat in Alice Springs, then surely rock walls and buildings, large areas of concrete, and solar panels, all on a downward sloping lee side of a hill, will cause artificial warming at Wilsons Promontory. Wilsons Promontory is a far from ideal site. Thus we see at Wilsons Promontory misinformation and lack of transparency through failure to supply digitised raw data to allow replication; incompetence through not using basic checks for data integrity, resulting in publication of the “world’s best practice” temperature dataset with minimum temperatures higher than maximum; use of UHI contaminated sites when making adjustments; use of distant neighbours from different climate regimes; over-zealous adjustments resulting in worse comparison with neighbours than before; all at a very poor quality site. Half-truths, incompetence, lack of transparency, and unscientific practices are evident at many other sites. A proper investigation into the Bureau is overdue. 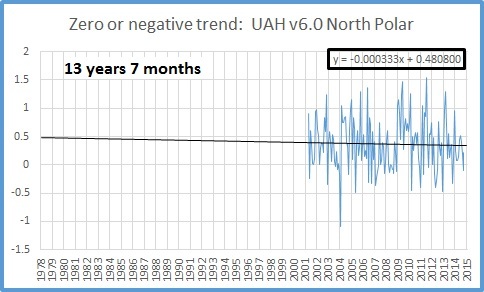 UAH v6.0 data for September were released on Wednesday. 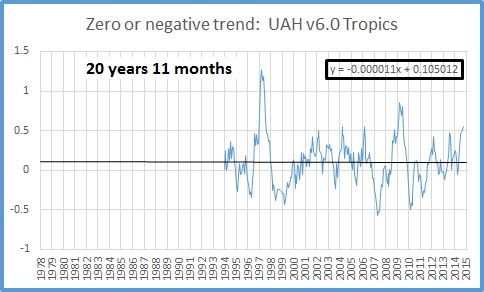 Here are updated graphs for various regions showing the furthest back one can go to show a zero or negative trend (less than +0.01C/ 100 years) in lower tropospheric temperatures. The strongest El Nino since 1997-98 is affecting some regions more than others. Note: The satellite record commences in December 1978. The entire satellite record is 36 years and 10 months long. There has been zero trend for exactly half the record. 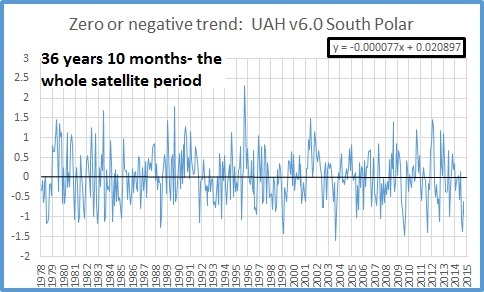 For more than half the record the Southern Hemisphere has zero trend. Only 13 years and 7 months worth of Pause here. 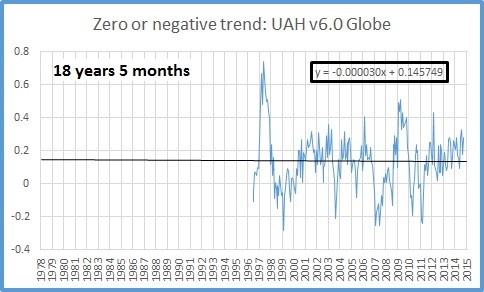 So much for a fingerprint of warming due to the enhanced greenhouse effect being greater warming at the Poles! The Pause continues. To borrow a phrase, our children won’t know what warming looks like! After 21 seasons, finally the North Queensland Cowboys have won a nail biting RL Grand Final, beating the Brisbane Broncos 17-16 in Golden Point time. J.T.’s under there somewhere! It was a hard, fast, clean game right to the end, and in the end, the best team won. It got me thinking, what would the climate change debate look like if it was conducted like a Rugby League game? Both teams would play hard but fairly. There would be a salary cap, so no team would have an unfair financial advantage. The referees would be impartial, and would not award penalties unfairly against one side. Anyone who infringed the rules (say by not letting an opposing player play the ball/ have his say) would be penalised. Media commentators would give coverage to both sides, and show all plays both good and bad. Referees, spectators, and the media would not try to prevent one team from even getting onto the field, or ban individual players from running on. The game would be decided by points scored, not by the number of supporters of one team. Politicians would not show up to be seen with the winning team…. Oh, wait…. Ah well, I can still enjoy the footy. You are currently browsing the kenskingdom blog archives for October, 2015.